No vaccination is required to travel to Ecuador and the Galapagos Islands. However, it is recommended to receive Yellow Fever, Hepatitis A and Typhoid vaccines especially if you are planning to take tours outside of the cities of Quito and Guayaquil (like the the Amazon and coastal regions) before of after your Galapagos tour. Please consult a health specialist for further recommendations. As of June 2018, a Health Insurance has become mandatory for all travelers entering Ecuador. This insurance must be acquired in your country of residency prior to your departure. Travel Insurance, while not being mandatory, is highly recommended to have, as it will protect you against unforeseen problems with your flight connections and the possibility of missing your cruise/tour. Please refer to our Terms and Policies section to review our refund policies. The Galapagos Islands do not receive international flights. 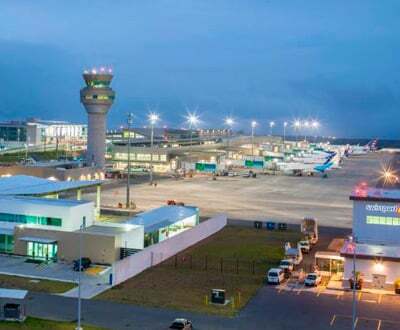 The airports from the mainland cities of Quito or Guayaquil receive all international flights in Ecuador. It is recommended to stay in either of these cities at least for night prior and after your cruise. You could even take part of one of our amazing add-on tours and trip extensions in continental Ecuador. The Andes countryside and the Amazon rainforest are just few hours away! Citizens of the United States, Canada and most European countries do not require a visa to travel to Ecuador unless they expect to stay for more than 90 days over the couse of one year. All travelers are required to have passports with a remaining validity of at least 6 months beyond their travel dates. 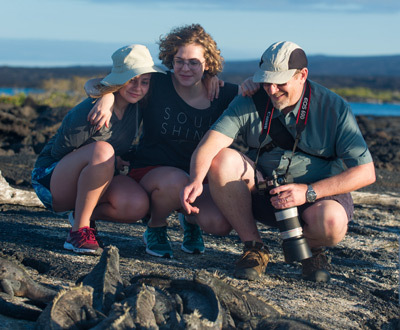 There is no age restriction for visiting the Galapagos Islands. However, some cruises, specially yachts and small boats, do not accept children under the age of 6 years old. Larger boats and cruise ships may be more accommodating to younger guests, some even offering special activities and services for them. Please consult with your trip advisor if you have any boat in mind for your Galapagos cruise and are planning to go with small children. Hotels in Galapagos don't have age restrictions. All travellers must come from the mainland cities of Quito or Guayaquil in local flights that take from 2 to 2.5 hours. Most cruise operators rely on particular flights that match the time of their itineraries for a seamless service. Please consult your trip advisor if you are planning to buy your Galapagos flights by your own. 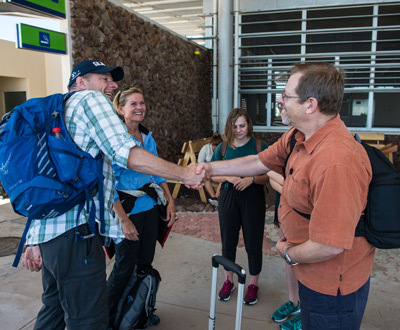 To learn more about flights to and from Galapagos click here. The acquisition of the TCC is mandatory to enter the Galapagos Islands. It has a value of US$20.00* payable only in cash at the airports of Quito or Guayaquil, before embarking your Galapagos flight. After acquiring the card you must pass your luggage through a security point where it will be inspected for items not allowed into the islands, such as fruits and vegetables. Once at the airports of Galapagos (in the islands of Baltra or San Cristobal), international travelers are required to pay a National Park entrance fee of US$100* per person. This one-time-only amount helps the Ecuadorian government on the conservancy and protection of this pristine environment. All boats cruising the Galapagos Islands must endure a rigorous process of approval on many technical and logistical aspects to be allowed to operate in the National Park. The sites visited, time of the day and activities allowed, and even the maximum number of passengers, is regulated in order to make the least impact on this fragile ecosystem. Private owned yachts are not allowed to visit the Island's points of interest but are allowed to dock on the main ports with an official approval. All travelers must obey the following regulations while in the Galapagos Islands National Park. Failure to comply with these rules may result in sanctions by the Ecuadorian government. Keep a distance of 2 meters from wildlife including your cameras. Take pictures without flash. Professional shootings and drones need authorization. Camping is only allowed in authorized areas. Use authorized sport fishing boats. Motorised water-crafts, submarines, and air tourism is prohibited. To visit protected areas with a specialized guide only. Use authorized tourism services only. The Ecuadorian government has implemented regulations to restrict the consumption of single-use plastics in the Galapagos region, including plastic straws, single-use plastic bags (t-shirt type), polythene containers (such as those used for takeout), and plastic bottles. Therefore, all passengers visiting the islands will not be allowed to take along with them, or in their luggage, any of the type of objects described above. This regulation is effective as of June 2018.